In our Pinterest age of handcrafted children's parties, artistic Instagram photos, tutorials for renovating old furniture into new treasures, and blogs filled with poetry, prose, and other creative expression, it is clear that a brand-new generation of creative women is rising up. It is a renaissance born not in Italian cathedrals or Harlem jazz clubs but in kitchens and nurseries and living rooms around the world. But when Christian women become mothers, they often feel expected to lay down their creative pursuits in order to properly parent. Wendy Speake and Kelli Stuart know that struggle. While they acknowledge that some seasons of mothering require setting artistic pursuits aside, they also argue that these seasons don't have to last until empty nest time. Instead, mothers with creative gifts are called to actively use them in order to bless their families, their communities, and everyone they encounter. Inspiring and encouraging, Life Creative celebrates the ways mothers can live their art in the midst of their mothering. They tell the stories of women such as author and speaker Angie Smith, recording artist Ellie Holcomb, and jewelry designer Lisa Leonard who do just that. By following God's leading to embrace His gifts, renaissance moms can model the joy of obedience for their families. I loved the encouragement in this inspiring book! I've been feeling like I've neglected many of my creative talents, and regretting it. The authors helped put things in perspective- the never ending balance of motherhood, work, and homemaking. They helped me see that my creative gifts are God-given and can be incorporated into my life as it is now, even if it's in small ways or through ministering to my children. They focus on the importance of using our creativity to inspire our faith, but I never felt a guilt-trip, rather immense understanding for the difficulties mothers face, especially those with young children. The topic is approached from various angles, and I especially appreciated the thought that women help lift each other since I feel a great connection to the friends in my life who are in similar circumstances. I am excited to embrace my new identity of Renaissance mom and sanctify some of my time to tap into the part of my soul that yearns to create. I highly recommend this book for all moms, especially those who are feeling the urge to become more creative! Is there room for creativity and children in a mother's life? 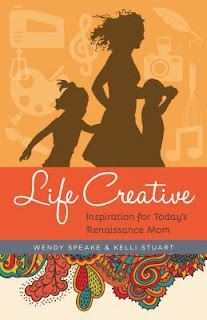 Learn how to balance home, art, and family in Wendy Speake and Kelli Stuart's new book, Life Creative. In this Pinterest age of handcrafted children’s parties, Instagram photos of beautifully decorated homes, and blogs filled with poetry and prose, it is clear that we are in the midst of a brand new artistic renaissance. Life Creative paints the stories of moms, just like you, who are fitting their inspired lives into the everyday, ordinary places of motherhood. Join Wendy, Kelli, and other moms in celebrating the beauty of being a creative mom by entering to win the Called to Be Creative Giveaway (details below) and by attending their author chat party on October 27! Enter today by clicking the icon below. But hurry, the giveaway ends on 10/27. The winner will be announced at the Life Creative Facebook party. RSVP for a chance to connect with Wendy, Kelli, and other creative moms, as well as for a chance to win other prizes! RSVP today and spread the word—tell your friends about the giveaway via social media and increase your chances of winning. Hope to see you on the 27th!